This year’s Desertfest line-up is arguably the most eclectic, and yet satisfying to date. Spread over three glorious days in Camden, North London (3-5 May) Desertfest have just announced that the incomparable AMENRA will celebrate their 20-year anniversary by bringing their uniquely atmospheric sound as headliners of Saturday’s main stage and, for the first time in the UK, an even more intimate side of AMENRA takes place at The Underworld on Sunday with solo performances from CHVE & SYNDROME. For AMENRA to headline Desertfest as they celebrate their 20th anniversary makes it all the more special for both festivalgoers and the band themselves. There are few artists with such a magnitude of raw talent in their remit that they pave the way for an entire collective of musicians but the Belgians have done so with ease, making them the one act not to miss live across the weekend. Year after year Desertfest is about offering up a diverse bill that allows for discovery, whilst celebrating the musical foundations of the festival, and the final Saturday night headliner and remaining 27 acts do just that. 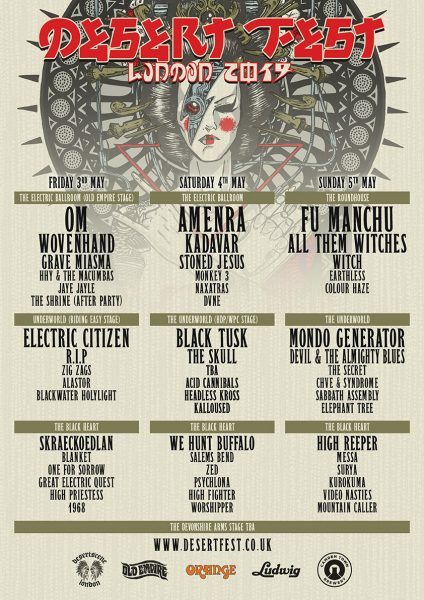 Ticking those ‘wish-list old school desert rock’ boxes on Sunday are FU MANCHU and WITCH at The Roundhouse, whilst pushing the boundaries of heavy on the opening Friday at the Electric Ballroom are HHY & THE MACUMBAS and GRAVE MIASMA. Desertfest are also pleased this year to announce a stage takeover from the mighty Riding Easy Records, the righteous west coast label will not only bring the sun (we hope) but a hefty dose of fuzzed out riffs from their roster. Headlined by rock’n’rollers ELECTRIC CITIZEN who refuse to be pigeonholed with a 70s proto-metal sound that chimes into psychedelic realms, ELECTRIC CITIZEN are an act whose unique attitude to heavy music is best experienced live. Completing the stage showcase are 80s punk heavy metal hybrids ZIG ZAGS, hazy Swedish doom newcomers ALASTOR and the low and slow psych goth-rock sounds of BLACKWATER HOLYLIGHT. Desertfest also welcome back long-time partners HDP/WPC for another takeover of The Underworld on Saturday, main man Staggerin’ Matt provides the lowdown on what the heaviest stage of the weekend has to offer: “The goal of the Human Disease Promo / When Planets Collide stage each year at Desertfest is to bring a mix of no nonsense, heavy as is out there, earth moving bands to the festival. Those which we not only dig personally, but who bring a dynamic and sonic force to ramp up the proceedings. “For 2019 we’ve assembled another motley crue of riff rollin, mind twisting, and sense engulfing bands to tear your heads clean off, as well as some to simply start a goddam party!! Topping the bill, the riff muscle of Savannah, Georgia is brought back to The Underworld by the mighty bruisers BLACK TUSK. These guys have had a rough ride and we’re stoked that they’re still at it, so it’s an honour to welcome them to the festival. And finally, Desertfest round off with the brilliant SKRAECKOEDLAN, BLANKET, SALEMS BEND, SURYA, HIGH PRIESTESS, ZED, KUROKUMA, GREAT ELECTRIC QUEST, PSYCHLONA, VIDEO NASTIES, ONE FOR SORROW, WORSHIPPER, 1968 & MOUNTAIN CALLER all added to the monumental 2019 line-up. Day tickets are now on sale – All you need to know is here.